Have you ever thought about how the snow depth changes outside your house over winter? 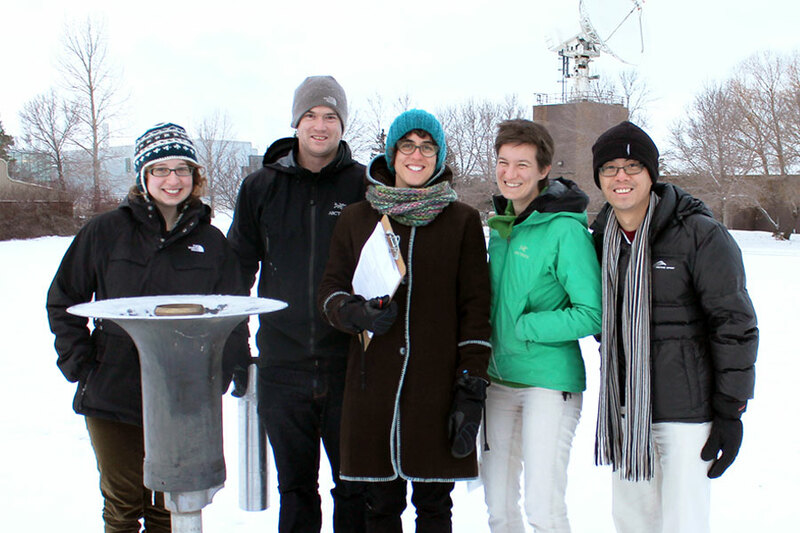 For the second year in a row, a group of young scientists from the U of S are exploring the dynamics of snow conditions in the urban environment. Every day, graduate students, postdoctoral fellows and other staff at the Global Insitute for Water Security record snow depths, snowfall and snow density in the field across the road from the National Hydrology Research Centre at Innovation Place. Having received formal training in a wide range of environmental fields and coming from all over the globe, not everyone involved was familiar with the characteristics of snowfall—or with the issues associated with measuring snow. As snow processes involve complex dynamics of energy and water balance, changing snow conditions data are useful information to measure environmental fluctuations. Apart from snow amounts, stable precipitation isotopes are also measured in the project to provide leading edge tracer information for understanding regional water sources. The group is not only gathering interesting data sets, the project also prompts the young scientists to explore good field monitoring practices with federal scientists and to understand values of continuous measurements. – finding out that the daily snowfall amounts did not add up to the total amount measured in the snowpack by the end of winter. The team has improved their measuring tools this year to reduce the amount of measured snow lost to wind and other factors. What started as a team-building effort to pull the group through the long winter ended up sparking heated debates during lunch breaks. These debates were not just among the participants about how to standardize the squatting height to minimize the measurement error—snow depths are measured with rulers that are fixed to wooden posts—but, also with Environment Canada colleagues about the difficulties of getting reliable daily snowfall data from manual and automated stations. In order to make the daily dataset more reliable and to improve their measurements of daily snowfall, a nipher gauge and wind meter were added to this year's experimental setup. A nipher gauge captures snow and has a shape like an upside down bell to reduce the amount of snow lost to wind. The snow is then weighed to estimate its water content. Still, measuring snow is not without difficulty. Even with over 20 participants in the group, volunteers are hard to find for weekends and public holidays, especially when temperatures plummet. However, gaps in the rotating schedule are usually filled by some enthusiast, even on New Year's Day. The team hopes this campaign will reach the same level of coverage as last winter and mark the start of an office tradition. Sun Chun and Willemijn Appels are post-doctoral fellows in the School of Environment and Sustainability and GIWS associate members.